In this post you get the post for download, the driver for Epson Stylus SX215. The SX215 Epson Stylus printer has individual cartridges, these ink cartridges provides better performances and become economic when changing the cartridge since the cartridge that is not printing can be changed without changing the others. This printer can be defined as an elegant Epson All in One printer, due to its design this printer can be placed in any part of your room, whether at home or in the office. With the SX215 Stylus you can print really good photographs even without using the computer since this printer counts with a innovative system that allows printing from a cellphone. Besides, it also has memory reader, making it easier for you to print from a memory device either from your cellphone or from your camera memory card. 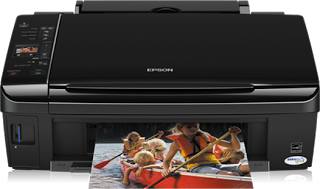 With this printer you can copy, print and scan with the best Epson quality. Before printing you can see the images in the 3.8 cms LCD screen, it has a 5.760 x 1.440 ppp printer resolution and also it allows you to scan at 1.200 ppp x 2.400 ppp (horizontal x vertical) and it is compatible with the Windows 2000, Windows Vista, Windows XP operative systems, too. The downloading drivers process is a very easy one, all you have to do is to download the driver and place it in your printer where you can easily find it, one of the major problems you have to face are the difficulties when installing the driver to do so after helping you with the driver we will give you some specifications that could help this driver to work properly. To download the driver for the SX215 Epson Stylus printer click on the corresponding with the operative system following links. Read how to identify the operative system if you do not know. Driver for SX215 Epson Stylus in case of having Windows 7 (can be used for XP). Download user manual in pdf (English). When the file is downloaded all you have to do is to unzip the file and locate it in a place where it can be easily and quickly found. Go and look for a file called Setup, click on it to run it and move to install it, follow the steps as the process demand it and this way you can have the driver installed and lately a perfectly working printer.